Finding reliable and trusted manufacturers to make your private label product is one of the most important steps in your online business journey. After all, manufacturers are the people you’re handing your money over to in order to get your business off the ground. This will most likely be your biggest financial investment as a new eCommerce entrepreneur, which is why it’s so important to get it right. The internet is full of product manufacturers, based all around the world. And they all make claims and promises about quality, reliability, and price. But how do you know which manufacturers walk the talk and deliver on their promises? How do you know which manufacturer is right for you? This guide will help you get started on the right foot. Here we’ll take you through 9 different ways to find manufacturers to make your product. We’re confident that at least one of these resources will connect you with a reliable, good quality manufacturer. Trade shows (also known as trade fairs) are exhibitions where companies and manufacturers showcase their products and services in an attempt to attract new customers. They are a great place to meet manufacturers face-to-face, which can provide you with greater confidence and peace of mind than emailing back-and-forth with a faceless company overseas. At trade shows, sellers can ask questions and have them answered while looking the manufacturer in the eye. Prior to the internet, trade shows were the main way that manufacturers and sellers built relationships and did business. Today, trade shows are still a great way for sellers to meet manufacturers, see their products, and foster lasting business relationships. By visiting local trade shows you’re more likely to meet local manufacturers, which can be beneficial when it comes to logistics and shipping. However, there are hugely popular trade shows all over the world, including the global manufacturing hub, China. SaleHoo is building a list of local trade shows around the world, organised into specific niches. This will become a go-to resource for sellers wanting to meet manufacturers in their niche at trade shows in their area. Otherwise, the best way to find trade shows in your area is by searching on Google. Trade fairs will most likely be listed on local event websites. There are also Facebook groups you can join to stay in the loop. China is the world’s largest manufacturer. It’s also one of the most common places that online seller’s turn to for manufacturing. If you’re up for making a trip to China to meet manufacturers in person there are plenty of great trade shows to choose from. Some of the biggest trade shows are The Canton Fair in Guangzhou; The Yiwu Commodities Fair in Zhejiang; and the East China Import and Export Commodity Fair in Shanghai. There are trade shows for almost every industry all year round in the United States. The M+A Expodatabase is a great resource, providing an up-to-date list of most of the trade shows in the US, organized by niche. If it’s important for you to be selling American made products, then this could be a great option. 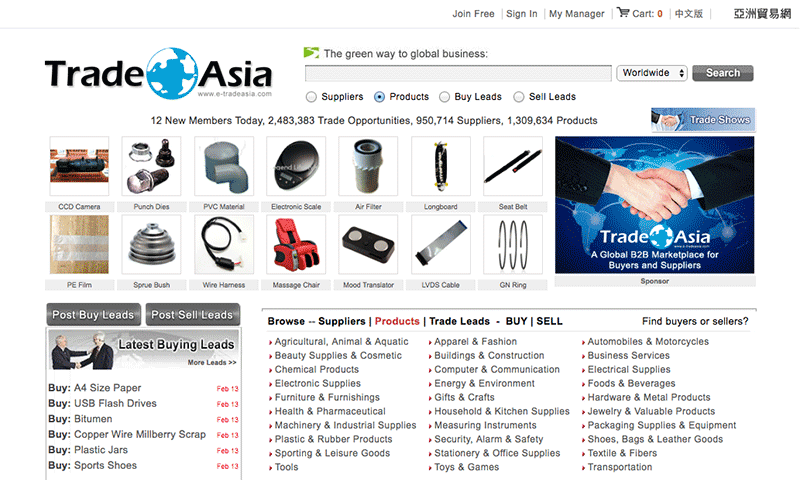 Etradeasia.com is one of the world’s largest trade portals and online marketplaces with more than 700,000 members and a million products. It’s a great place to source suppliers and manufacturers. A search of ‘clothing’ suppliers found 897 matches. No matter what your niche is, you’re bound to find suitable manufacturers on this website. It’s a lesser-known option than some of the major online marketplaces and could therefore contain untapped potential. Lightinthebox.com offers lifestyle products at attractive prices direct from the manufacturers — no middleman needed. It’s a global online retail company specializing in apparel, small accessories and gadgets and home and garden products. While it’s not officially a supplier directory, many of the listings include contact details for suppliers. This means that you can contact them directly to ask about manufacturing. With more than 6 million Facebook likes, this website is popular and trusted worldwide. Alibaba.com is the world’s biggest supplier directory with an estimated 279 million active buyers and 8.5 million active sellers. It’s largely set up as a B2B service. Whatever your niche or product is, you can almost guarantee you will find a manufacturer here. Most manufacturers on Alibaba have an MOQ (minimum order quantity), which means you have to buy in bulk. This is good in terms of getting the best price, but can be a stretch financially when you’re starting out. You can find suppliers and manufacturers simply by searching your product and the words ‘private label’ or ‘manufacturer’ in the search bar. 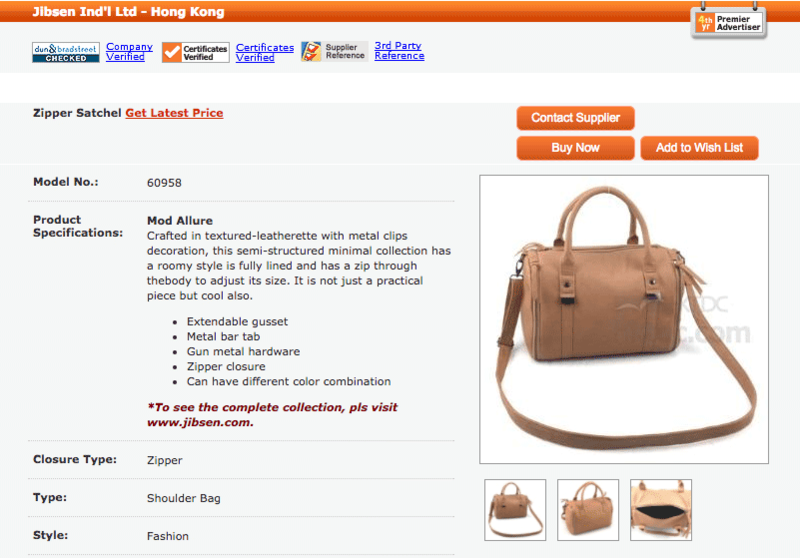 However, if you become a verified buyer you can gain access to Alibaba’s more detailed supplier directory. This allows you to search for experienced suppliers, view their trade records, see some of their main customers, and other background information. While you can find trusted manufacturers off your own back, becoming a verified buyer provides you with more information and security. It’s also recommended to seek out Gold Supplier members, which have been verified by Alibaba. Aliexpress.com is owned by Alibaba, but it was built to serve a different market. You won’t find as many manufacturers on AliExpress, but the plus side is that you can place smaller orders, which makes it a good option if you’re starting with limited capital. You will need to do a bit more digging on AliExpress to find manufacturers. It will require contacting suppliers and seeing if they can manufacture your product for you. The good thing about AliExpress is that you can buy one of lots of different products in your niche before settling on the one that you want to have manufactured. One way to ensure you’re dealing with reliable suppliers is by sorting listings by ‘seller rating’. 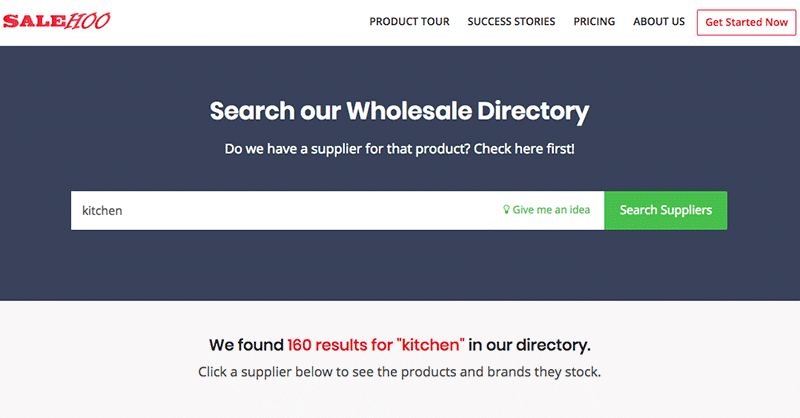 The SaleHoo Wholesale Directory has more than 8,000 low-cost suppliers and 1.6 million products and brands. The SaleHoo team checks and verifies each supplier before adding them to the directory, which means that you don’t have to worry about dealing with potentially problematic suppliers. While not all of the suppliers in the directory are manufacturers, you will still find hundreds, if not more, of them in the directory. It then just takes one click to see all of the manufacturer’s contact information, including phone number, email, and physical address, as well as details such as their trustworthy score, product range and quality, and customer service information. The Hong Kong Trade Development Council (HKTDC) is the international marketing arm for Hong Kong-based manufacturers, traders and service providers. It’s a lesser-known supplier and manufacturer directory for a huge range of products, from auto parts and accessories to electronics, jewelry, textiles, and toys. It’s very simple to contact suppliers. There’s even a pop up message box to email the supplier directly. Just make sure you check that the supplier is verified and has a third-party reference before you contact them about possibly manufacturing your product. MFG.com has been described as “the eBay of manufacturing”. It’s a global database of manufacturing companies. But you won’t find any cheap novelty items here. MFG.com specializes in heavy duty products like gears, molds, and machined parts. If you’re an entrepreneurial engineer looking for a manufacturer to undertake die casting, injection molding, or rapid prototyping, then MFG.com is your best bet. It’s free to create an account and get started. Amazon CEO Jeff Bezos is an investor in the company, so you can be sure that it’s legitimate. Clothing is one of the most popular eCommerce niches, but it can be a challenge to find good quality manufacturers, particularly when you’re relying on offshore mega factories. Creating patterns, choosing fabrics, having samples made up, making alterations, and placing orders can be a laborious process, so you want to be sure that the final product is exactly what you imagined. Here are a few examples of reliable clothing manufacturers located in different parts of the world. But don’t take our word for it. Make sure to do your research, just like you would with any other manufacturer, to be certain that they’re the right fit for you and your clothing line. makersrow.com Makersrow.com connects clothing designers and small to medium-sized businesses with States-based factories and manufacturers. This is a great option if you want to slap an ‘American Made’ tag on your clothing line, or simply prefer to work with domestic manufacturers. The company has provided over 80,000 businesses with opportunities to work with domestic manufacturers. sqetch.co Sqetch.co is based in The Netherlands and connects clothing brands with European manufacturers. It has a user-friendly interface where you simply input the type of clothing you want to produce, as well as the fabric and number of units. You can then contact a range of suppliers that fit your requirements and work with them throughout the production process. The directory has more than 1000 manufacturers that have worked on more than 2500 projects. indiamart.com Indiamart.com is an online marketplace, similar to Alibaba and Aliexpress, only smaller. It’s a valuable resource if you’re looking at manufacturing clothing in Asia. A search for ‘ladies jackets’ showed more than 4000 different suppliers, many of which would also offer manufacturing services. Factories in Asia are likely to be much cheaper than those in the USA and Europe, so if the price is the most important factor to you, it’s worth checking out Indiamart.com. As with many of the other websites listed above, make sure to go with verified suppliers where possible. I´m Michael and I´m looking for a factory who can produce my own customized and designed backpacks. I checked already many manufacturer via Alibaba.com but I couldn´t find a factory I really trusted. Now I heard from a start up called Matchory and I just wanna know if someone made any experience with them? would be nice to get any feedback. Sorry but I'm not familiar with the supplier you mentioned. You need to weed out the good suppliers from the not so good ones on Alibaba. There's no sure fire way to do that but be on the look out for suppliers who offer safe payment methods, allow sample orders and offer great (or good will do) customer support. i have been searching for a manufacturer that can produce a dog collar with LED lighting and GPS tracking... please help me out. Im looking for a manufacturer for a clothing brand with very low quantities. Must produce very high quality items for women! 2. After confirm they are manufacture in license. it not means the product you need is made by this company. They can also purchase from cooperate factory, then resell to you. 3. Contact some friend in China or generally supplier, they can do some help to check the real manufacture. You can find manufacturers online. The guidelines here will help you verify the ones that are based in China. Thanks! for sharing such as useful article. After reading the article i feel it this article is very helpful to clothes manufacturers.